کدیور, امین, امانی فرد, نیما, محدث دیلمی, حامد. (1397). بررسی عددی کنترل جدایش جریان در یک زنجیره کمپرسور محوری با استفاده از محرک پلاسما. نشریه پژوهشی مهندسی مکانیک ایران, 20(4), 177-204. امین کدیور; نیما امانی فرد; حامد محدث دیلمی. "بررسی عددی کنترل جدایش جریان در یک زنجیره کمپرسور محوری با استفاده از محرک پلاسما". نشریه پژوهشی مهندسی مکانیک ایران, 20, 4, 1397, 177-204. کدیور, امین, امانی فرد, نیما, محدث دیلمی, حامد. (1397). 'بررسی عددی کنترل جدایش جریان در یک زنجیره کمپرسور محوری با استفاده از محرک پلاسما', نشریه پژوهشی مهندسی مکانیک ایران, 20(4), pp. 177-204. کدیور, امین, امانی فرد, نیما, محدث دیلمی, حامد. بررسی عددی کنترل جدایش جریان در یک زنجیره کمپرسور محوری با استفاده از محرک پلاسما. نشریه پژوهشی مهندسی مکانیک ایران, 1397; 20(4): 177-204. در تحقیق حاضر کنترل جدایش جریان به‌وسیله محرک پلاسما در زوایای حمله بالا، در یک زنجیره کمپرسور محوری بررسی شده است. به‌منظور مطالعه تأثیر محرک بر کنترل جریان، مشخصه‌های جریان سیال از قبیل تابع جریان، نسبت نیروی برا به پسا و فشار کل، در حضور محرک و در موقعیت‌ها و ولتاژهای مختلف، به صورت عددی مورد ارزیابی قرار گرفته است. نتایج عددی نشان می‌دهد که استفاده از محرک پلاسما در موقعیت 15 درصد از طول وتر پره، ضمن کاهش اتلاف انرژی بیش از 18 درصد، منجر به بهبود عملکرد زنجیره کمپرسور می‌شود. Roth, J., Sherman, D., and Wilkinson, S., “Boundary Layer Flow Control with a One Atmosphere Uniform Glow Discharge Surface Plasma”, In 36th AIAA Aerospace Sciences Meeting and Exhibit, pp. 328-356, Reno, NV, U.S.A, (1998). Riherd, M., and Roy, S., “Measurements and Simulations of a Channel Flow Powered by Plasma Actuators”, Journal of Applied Physics, Vol. 112, No. 5, pp. 1-10, (2012). Enloe, C.L., McLaughlin, T.E., Van Dyken, R.D., Kachner, K.D., Jumper, E.J., and Corke, T.C., “Mechanisms and Responses of a Single Dielectric Barrier Plasma Actuator: Plasma Morphology”, AIAA Journal, Vol. 42, No. 3, pp. 589-594, (2004). Pouryoussefi, S. G., and Mirzaei, M., “Experimental Study of the Unsteady Actuation Effect on Induced Flow Characteristics in DBD Plasma Actuators”, Plasma Science and Technology, Vol. 17, No. 5, pp. 415-424, (2015). Wang, C.C., and Roy, S., “Active Cooling of Turbine Blades using Horse-shoe Plasma Actuator”, In 47th AIAA Aerospace Sciences Meeting Including the New Horizons Forum and Aerospace Exposition, pp. 679-694, (2009). 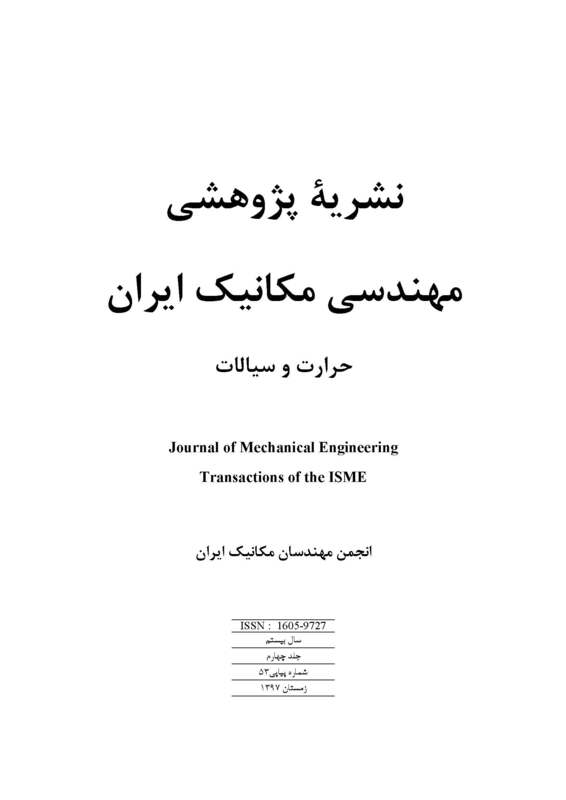 Salmasi, A., Shadaram, A., Mirzaei, M., and Shams, T. A., “Numerical and Experimental Investigation on the Effect of a Plasma Actuator on NLF0414 Airfoils Efficiency after the Stall”, Modares Mechanical Engineering, Vol. 12, No. 6, pp. 104-116, (2013). Rafi, A., Amanifard, N., Deylami, H.M., and Dolati, F., “Numerical Investigation of the Plasma Actuator Effects on the Flow Field and Heat Transfer Coefficient in a Flat Channel”, Modares Mechanical Engineering, Vol. 15, No. 6, pp. 23-30, (2015). Jukes, T.N., and Choi, K.S., “Control of Unsteady Flow Separation over a Circular Cylinder using Dielectric-barrier-Discharge Surface Plasma”, Physics of Fluids, Vol. 21, No. 9, pp. 1-16, (2009). Huang, J., Corke, T.C., and Thomas, F.O., “Plasma Actuators for Separation Control of Low-pressure Turbine Blades”, AIAA Journal, Vol. 44, No. 1, pp. 51-57, (2006). De Giorgi, M.G., Ficarella, A., Marra, F., and Pescini, E., “Micro DBD Plasma Actuators for Flow Separation Control on a Low Pressure Turbine at High Altitude Flight Operating Conditions of Aircraft Engines”, Applied Thermal Engineering, Vol. 114, pp. 511-522, (2017). Roth, J.R., Sherman, D.M., and Wilkinson, S.P., “Electrohydrodynamic Flow Control with a Glow-Discharge Surface Plasma”, AIAA Journal, Vol. 38, No. 7, pp. 1166-1172, (2000). Shyy, W., Jayaraman, B., and Andersson, A., “Modeling of Glow Discharge-induced Fluid Dynamics”, Journal of Applied Physics, Vol. 92, No. 11, pp. 6434-6443, (2002). Orlov, D., Corke, T., and Patel, M., “Electric Circuit Model for Aerodynamic Plasma Actuator”, In 44th AIAA Aerospace Sciences Meeting and Exhibit, pp. 1206-1216, Reno, NV, U.S.A, (2006). Suzen, Y., Huang, G., Jacob, J., and Ashpis, D., “Numerical Simulations of Plasma Based Flow Control Applications”, In 35th AIAA Fluid Dynamics Conference and Exhibit, pp. 4633-4644, Toronto, Ontario, Canada (2005). Herrig, L.J., Emery, J.C., and Erwin, J.R., “Systematic Two-dimensional Cascade Tests of NACA 65-Series Compressor Blades at Low Speeds”, NACA Technical Report 1368, (1957). Berbente, C., Andrei, I.C., Ene, N.M., Frunzulica, F., and Korody, E., “Special Topics on Map Meshing in Turbomachinery”, Periodica Polytechnica Transportation Engineering, Vol. 34, No. 1-2, pp. 59-68, (2006). Li, Y.H., Wu, Y., Zhou, M., Su, C.B., Zhang, X.W., and Zhu, J.Q., “Control of the Corner Separation in a Compressor Cascade by Steady and Unsteady Plasma Aerodynamic Actuation”, Experiments in Fluids, Vol. 48, No. 6, pp. 1015-1023, (2010). Hall, C., and Dixon, S.L., “Fluid Mechanics and Thermodynamics of Turbomachinery”, 7th Eddition, Butterworth-Heinemann, Waltham, (2013). Debiasi, M., and Li, J.M., “Experimental Study of a DBD-Plasma Driven Channel Flow”, In 49th AIAA Aerospace Sciences Meeting Including the New Horizons Forum and Aerospace Exposition, pp. 954-967, (2011). Medic, G., Zhang, V., Wang, G., Joo, J., and Sharma, O.P., “Prediction of Transition and Losses in Compressor Cascades using Large-eddy Simulation”, Journal of Turbomachinery, Vol. 138, No. 12, pp. 1-9, (2016). Bouchmal, A., “Modeling of Dielectric-barrier Discharge Actuator”, Master of Science Thesis, Department of Aerodynamics, Delft University of Technology, Netherlands, (2011).